Veil of Alaris is EverQuest's 18th expansion. It was announced on July 13, 2011, and had an official launch date of November 15, 2011. For the original announcement, see this news story. For the expansion release patch message, see this news story. Have better control of your characters experience with a revamp of the Hotbar system including the ability to display more hotbars with more buttons; assign icons to individual buttons; link and click on items from your hotbar instead of hot-swappping; and cool-down timers! Mail items and coin to your friends while they are offline; share profits from your adventures with your friends and receive items from them easier than ever before! Take Guild Halls to new heights with an integration of Tools and Functionality derived from EverQuest's robust Housing System. Customize and place your guild hall in one of our housing zones including multiple exterior and interiors. Check out this link for a list of zones in the Veil of Alaris expansion. There are no locked zones in this expansion. All zones are open. Progression centers around your Alaran Language skill level which is increased by doing tasks. You won't be able to request higher tier tasks until your language skill is up to a certain level. Note: With the release of the Rain of Fear expansion in November 2012, you can raise your Alaran language skill level to 100 via a simple task in Shard's Landing: Words of the Unspoken. 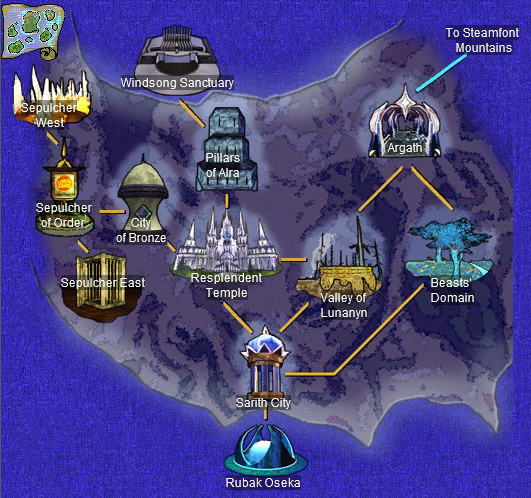 Other than the missions, none of the tasks in Argath or the Valley of Lunanyn require any language skill to request them. This expansion offers a different method of raid progression and backflagging, as well as an alternative way for players to obtain a raid drop they'd like (as opposed to waiting for the RNG (random number generator) to give them something out of a chest). Armor is produced in the same manner as in House of Thule. There are no progression requirements for producing Tier 1 and Tier 2 armor. Tier 3 and Tier 4 armor is locked behind a certain Alaran language skill level. Certain (or all) Class AAs may be locked behind an Alaran language skill requirement. This requirement should be low enough that a few tasks in Argath can overcome it. Spells are obtained in the same manner as in House of Thule (Rk. I vendorbought; Rk. II result from droppable turn-ins; Rk. III result from no-trade raid drops). Most spells are locked behind a certain Alaran Language skill level. Basic Level 91-93 spells have no language requirement. Other Level 91-93 spells and basic Level 94-95 spells have a language skill requirement of 25. Other Level 94-95 spells have a language skill requirement of 50. Tradeable Alaran Cantrips are dropped by mobs throughout the expansion. Hail The Sklyg in Beasts' Domain (just outside Argath, within the confines of the gates). You can request a task from him and choose which spell you want. Note: Rk. II spells require a certain Alaran language level before he'll give you the task (see below). NO TRADE Alaran Periapts are found in raid chests. Note: Rk. III require a certain Alaran language level before he'll give you the task (see below). Note: Language skill requirements for spells are expected to lessen over time. Plenty of lore was to be found in the VOA Pre-Launch events. See this quest entry for an overview and a list of events that went on prior to the expansion launch. This page last modified 2014-12-18 23:14:01.